How Prospect Theory Affects Investment Decisions | Confident. Returns. 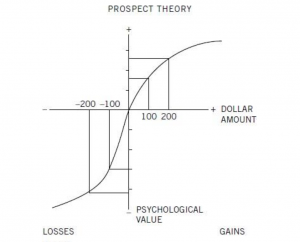 How Prospect Theory Affects Investment Decisions – Confident. Returns. Daniel Kahneman, a 2002 Nobel memorial prize recipient in economics had stated that people might drive all the way across town to save $5 on a $15 calculator but wont drive across town to save $5 on a $125 coat. Even though the end result is the same, more people would rather save $5 on the cheaper item because they believe the significance of the amount their saving is greater. Similarly, Richard Thaler had conducted an experiment where students were told they had just won $30. They were then offered a coin flip, where they would either win or lose $9. 70% of the students chose to do the coin flip. Other students were told they had also won $30 and then offered a different coin flip, this time they were told that after the coin flip they would either have $21 or $39. Even though there was a nine-dollar difference in both scenarios, this time only 43% of the students had to choose to do the coin flip. According to the results of this experiment, most people wont comprehend the entirety of the situation unless they are specifically told the parameters of the end result. The average person has an entirely different attitude towards risk associating gains compared to risk associating losses. An example of this would be the joy of gaining $500 compared to the joy of gaining $1500 and then losing $1000. Even though the end results are the same, most people would prefer the gain of $500. This irrational way of viewing gains versus losses is illustrated below. Most people will be more devastated with a loss than happy with a gain. The best way to avoid this is to understand your own risk tolerance. Before you invest into something ask yourself how much you would be okay with losing. New tools have been incorporated in how we help our clients assess their own risk tolerance by asking questions very similar to the ones that Kahneman and Thaler. *Special thanks to Edward Butterly for his contributions to this blog post.